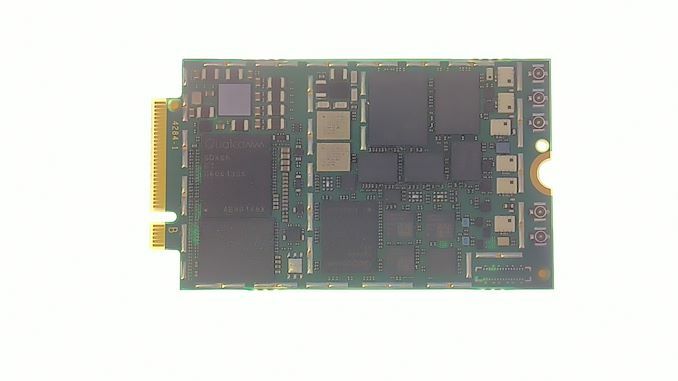 Last week we reported on that Fibocom, an Intel partner, had announced a new M.2 module featuring the Intel XMM8160 5G modem to be used in CPEs as well as upcoming PCs and laptops. 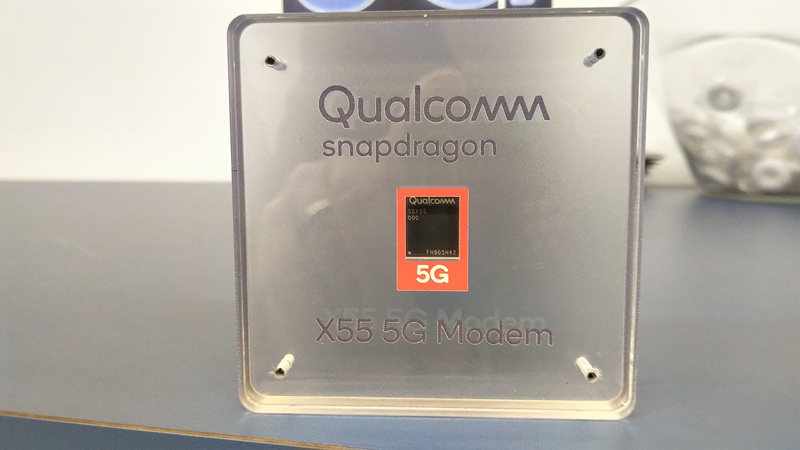 During the Mobile World Congress show, we actually saw this M.2 module on the Fibocom booth, but to our surprise, we also saw a similar M.2 module for Qualcomm’s X55 modem over at the Qualcomm booth. These modules fit the widest possible M.2 standard, coming in at 30mm wide, which is 8mm wider than the storage based drives we normally see in this form factor. When looking at the Fibocom module first, it was unclear why the module had to be this wide – surely the modem as not 30mm wide, I thought. 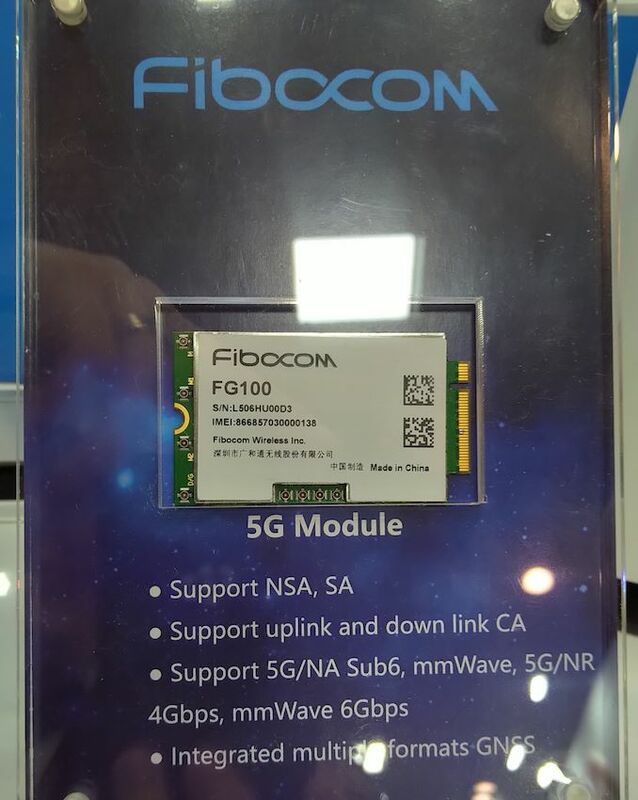 At the Fibocom booth, we also got hold of a specification list, confirming that the module was to support both SA and NSA networks, and also cover both 5G in the mmWave bands as well as sub 6 GHz. The specification sheet at Fibocom’s booth gave a full run-down of what this module, and by the fact that it uses Intel’s XMM8160 modem, including what bands it supports. The unit will support 2x2 MIMO, 4x2 MIMO, and 4x4 MIMO modes for download, but only 2x2 MIMO for upload. The 4x4 MIMO download mode will only be applicable on bands 1, 2, 3, 4, 7, 25, 30, 34, 38, 39, 40, 41, 42, 48, 66, n77, n78, n79. The unit also integrates support for GPS, GLONASS, Beidou, and Galileo. Drivers will be available for both Windows 10 and Linux. In terms of overall peak speaks, Fibocom lists the module as supporting download speeds of 2.4 Gbps LTE, 4 Gbps sub-6, and up to 6 Gbps in mmWave. This is more honest than the speeds reported to date of ‘up to 7 Gbps’, which is the maximum of potential combinations of both LTE and mmWave being used simultaneously. 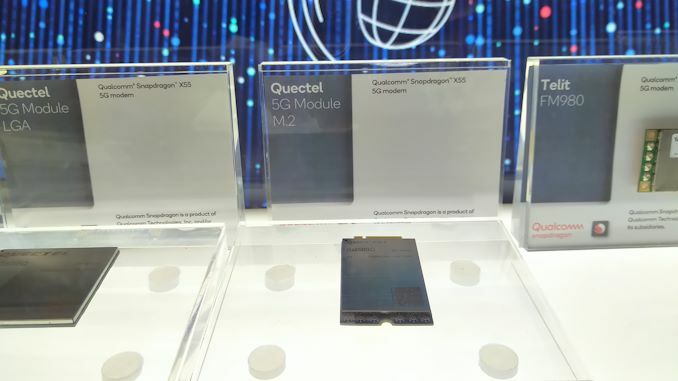 For upload, the module will support 450 Mbps on LTE, ~2.5 Gbps on sub-6, and ~3.0 Gbps on mmWave. 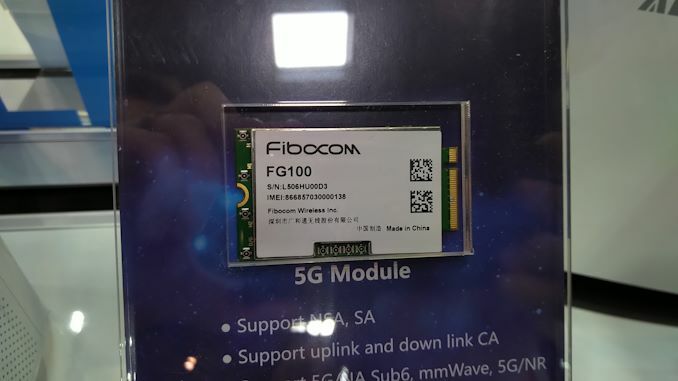 When speaking to the Fibocom representative on the booth, he stated that he expects the module to be used in devices in 2020, and they’re waiting for the hardware, software, and transceiver setup to be finalized, although he wasn’t able to say exactly when this would be. Fibocom has been a partner with Intel on 4G modems, and have supplied LTE units for lots of access points and to laptop manufacturers such as Dell, HP, and Lenovo. We should expect something similar when it comes to 5G, but only in 2020 and beyond. While the details of the X55 modem support were not on display, we were able to see an M.2 module without the EMI shield. Apologies for the exposure balance here – the module was on an LED lit panel from below and behind a plastic screen, making any photography really difficult. The chip on the far left is the X55 modem, which is clearly a lot smaller than the 30mm width of the module. Below it seems to be a sizeable amount of DRAM, and above it is a power management controller perhaps? This side is clearly the digital signal part of the design, as there seems to be some PCB separation to the analog side to the right. I’m counting 10 different chips here, likely to deal with signals coming in. This goes out to the five antenna connections on the right (the Fibocom module had eight, the Qualcomm partners had four). 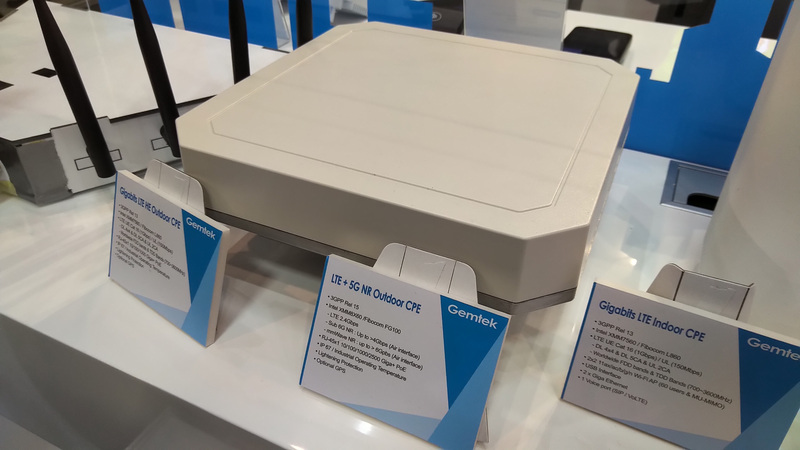 Smartphones are not the only deployment vectors for 5G modems, and we’re likely to see Mi-Fi and laptop deployments consume a fair few as well. When we interviewed Qualcomm’s President, Cristiano Amon, at the company’s Tech Summit late last year, he saw 5G being used in the suburbs being used instead of the last mile of cable from the cabinet to the home, removing the need for a cable completely. When and if mobile data costs can become as low as wired home connection data costs, this could very well become one key enablement of 5G. "he saw 5G being used in the suburbs being used instead of the last mile of cable from the cabinet to the home, removing the need for a cable completely"